Fittingly, War in Heaven, as the first of Williams’s published novels, begins with a highly fantastical (i.e. “marvelous”) premise: What if the Holy Graal was found hiding in plain sight in 1930s England – and provided great power for either Good or Evil? This lays for the foundation for a grand, poetic drama of spiritual warfare, Arthurian lore, Black Magic, and divine providence. From there, the first part of the book unfolds like a murder mystery, though – unlike most true detective stories – the murderer is revealed to the audience quite near the beginning. The rest of the story is spent uncovering his specific motivations for the murder and how it fits into his larger plans. The closest comparison would be the contemporary thriller genre, though the pacing is quite different and can seem somewhat slow to a 21st century reader – the “action” element, while present, is de-emphasized in favor of characterization and dialogue. This is somewhat understandable, as Williams wrote well before the rise of contemporary cinematic culture (in England, at least, classical and Elizabethan drama largely occupied the cultural space now taken by Hollywood films). The plot, however, is kept riveting by the placement of “hook” revelations at key places in the story. It also has a somewhat unconventional structure that reverses linear time in places – some chapters will end with an event that the next chapter then precedes. Somewhat unusually from the standpoint of contemporary writing (and sound business practices), the book’s cast of characters is portrayed in a way that makes the antagonist clear from the very beginning but leaves the identity of the main protagonist or “hero” debatable (some clarity comes only at the very end). This approach has both advantages and disadvantages. On the one hand, it allows for a wide cast of interesting characters all receiving more or less equal time within the story. On the other, it can sometimes result in ambiguity as to exactly where the story is going – though the plot itself (and the MacGuffin device) mostly compensates for this. Characterization is otherwise fabulous: the villain and his supporting characters, in particular, are drawn in a compelling, operatically heightened fashion that leaves no doubt about their evil nature but avoids caricatures. This is no mean accomplishment in a story about Good and Evil in the very highest sense. The author’s own classical education comes through in the constantly poetic tone, expansive vocabulary and extensive use of Latin quotations (the average reader will probably appreciate having a dictionary near at hand). The book is also heavy with philosophical and theological concepts that, while they add thematic layers to the story, can seem esoteric to an outsider and require some mental effort to digest – particularly when appearing in the characters’ dialogue. Also, the spiritual elements (predominantly orthodox) are derived from High Church Anglicanism and may appear strange to those outside this tradition (like myself). I nevertheless found the concepts interesting (from a skeptic’s viewpoint), and much of the imagery was genuinely enriching in a poetic sense. There are, of course, some elements of the book that I would charitably describe as dated. Authors from the 1930s are apt to use “ethnic” descriptions a bit more freely than a 21st-century audience would find appropriate. This book contains no outright slurs, but this sentence is used in reference to one of the antagonists (a particularly nasty individual who practices Black Magic): His bearded face was that of a Jew. It’s hardly overt (or even intentional) anti-Semitism, but it’s clearly something written before such sentiments were considered beyond the pale. This book was also written prior to the emergence of “Christian Fiction” as a separate market as well as the associated content standards. As such, while free of sexual content and technically a “Christian” novel, it does make use of profanity in places. This is usually “mild” terms such “d*mn”, “h*ll” etc, but there is also at least one use of the word “b***h” and of the Lord’s name in vain. I will point out that both of these last are clearly intended to illustrate the speakers’ own moral failings or depravity. It is, however, something more sensitive readers may want to keep in mind. 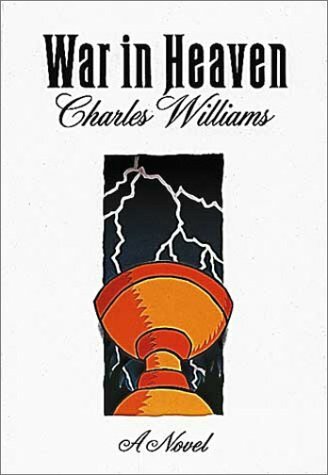 All in all, I would describe War in Heaven as a volume of compelling drama, skillful wit, beautiful language, gorgeous imagery, and ultimately, great literary value – but one can easily see why it has not achieved the lasting commercial success of either Lewis or Tolkien’s works. I would recommend it to anyone currently writing supernatural or spiritual thrillers – it’s an interesting example of how these types of stories were written decades before Frank Peretti. I myself look forward to exploring more of this author’s literary creations. Sorry you haven’t heard much from me in a while. For the past two months, I’ve been fighting an awful bug and most of my free time has been dedicated to recuperating in bed. That said, I seem to be on the tail end of it (finally). I tried reading this book once but couldn’t quite get through. From what you’re saying, maybe I should give it another chance. How’d you hear of this book? What made you want to check it out in the first place?